I have been participating in the Young Survival Coalition (Duluth) Scrap for Survival since I met Alane a few years ago at the Chicago CHA Show. The Young Survival Coalition supports young women across the US, diagnosed with cancer whether you are newly diagnosed, a survivor or a caregiver. I live here in California so I participate by creating something that can be offered in a silent auction at the event. I thought I would share what I created before it gets packed up and shipped off this week to my friend Alane. I used a picture of my niece's family just to show you a finished tray. When I send the tray, it will have an empty spot so the buyer can put their own family picture in. Also included is a set of chipboard numbers to personalized the top right corner. The Photo Shadow Box Tray (16 x 12") is 7gypsies of course, as is the easel it is sitting on. The paper is from My Minds Eye - Kraft Funday, 6 x 6 pad that I picked up at my local scrapbook store, The Shabby Scrapper. I cut the flower shape from the MME paper and held it in place with a memo pin and a cork. I added some text paper and a vintage watch face. 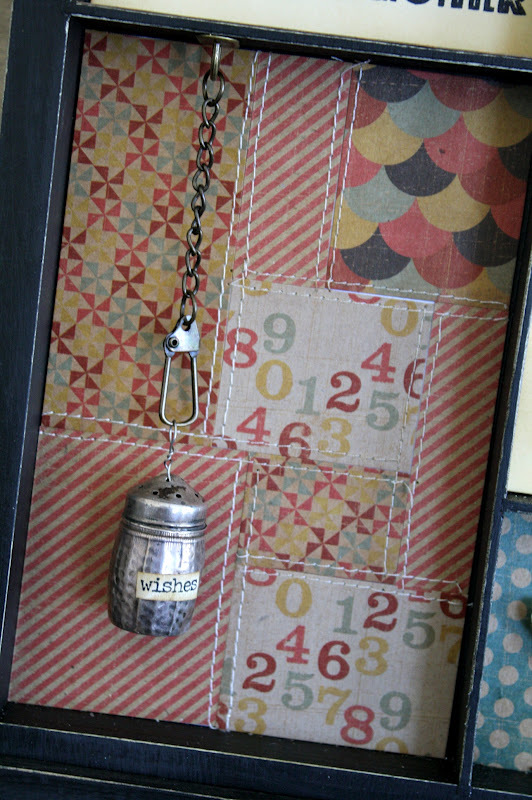 The hanging dots are part of an extra embellishment pack from MME. Apothecary bottles and background card are 7gypsies and the words "beautiful life" came from the new chitchat stickers from Idea-ology. The phrases card I made myself. This one fits the tray at 4 x 5 1/4". If you want a copy of the PDF file, just email me. The hanging tin is an old salt shaker that I wired to a swivel clasp. The swivel clasp is hanging from a hook created by 7gypsies specifically for the trays. Can't get enough of these. To make the patchwork background, I cut a piece of computer paper the size of the tray opening. I cut pieces of the patterned paper and adhered them to the white paper with a small amount of tape from a tape runner until it looked like a patchwork quilt. This is what the back looked like in the end. If I had some loose stitches on the edges I just taped the strings down with scotch tape. 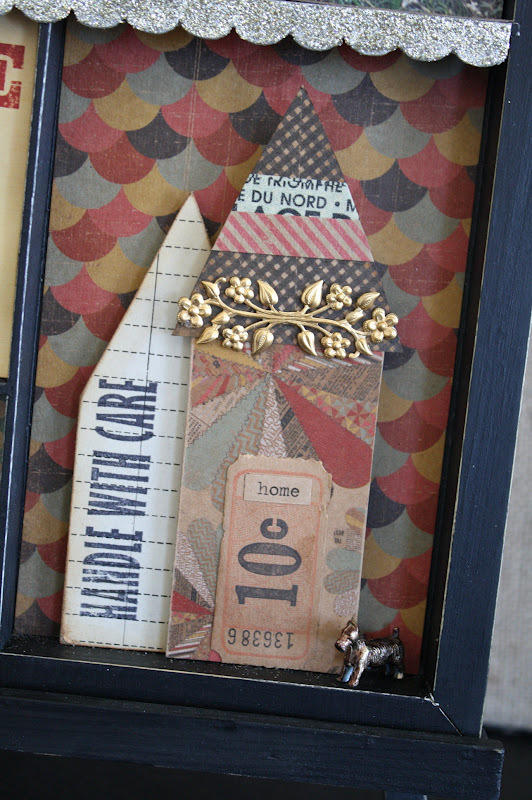 Here I just cut some very simple house shapes from chipboard and decorated them with vintage paper and new. The stamp is from the old Disclaimer stamp set (seriously one of my all time favorites). The 10 cent ticket is vintage with another chitchat sticker added. The metal piece, I believe, came from my visit to Red Lead Studios (my favorite store in St Louis). The little dog is from a Monopoly game. I just gave him a brown coat of Alcohol Ink. 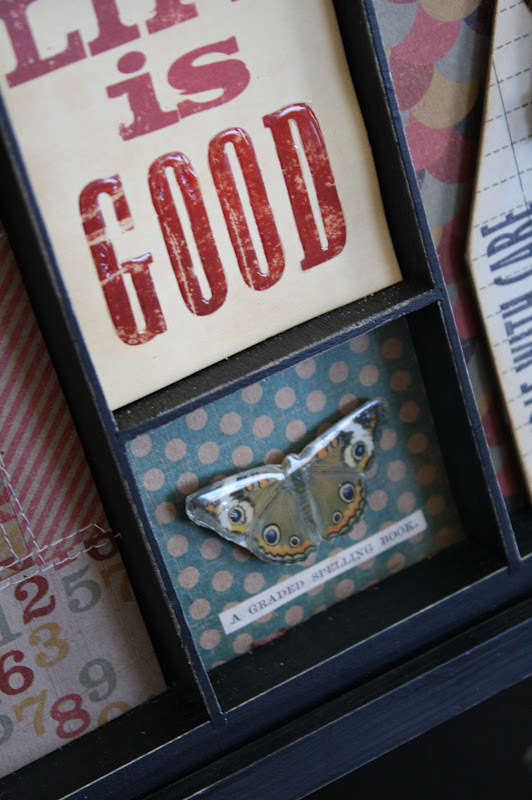 And lastly, I used some glossy accents on the word, good and the butterfly. So that's it for today. Time to pack it up and ship it out to Alane. Again, if you want to know more about YSC or find a local chapter you can click here for the home page then click on the city closest to you. And if you live near Dulth, MN and might want to participate in the 15 hour scrapbooking event on April 21st, you can register here. cheers to Alane for her ongoing efforts in this cause! As always your work is beautiful. I took love to use glossy accents on one part of a bigger piece. So fun. I missed the giveaway by one line. I actually read her comment before I posted mine and it was the only one I read. Hilarious! A beautiful project! I love the little salt shaker of wishes - wonderful! Love the teensy tinsy (Ty's words) salt shaker! And a scrapbook store close by!?!?!? I'm so excited!! Thanks Paula! Great work and for such a good cause. GREAT shadow box! Love all the little details. Hope it brings top dollar at the auction. As always ... beauiful work and what an awesome way to giveback. Love the tray. Wonderful use of paper, color and elements! Thanks for sharing your process. I saw the little swivel clasp the other day in the store and wondered and now I know. Love the job you did. So neat and a worthy cause. Thanks for sharing. 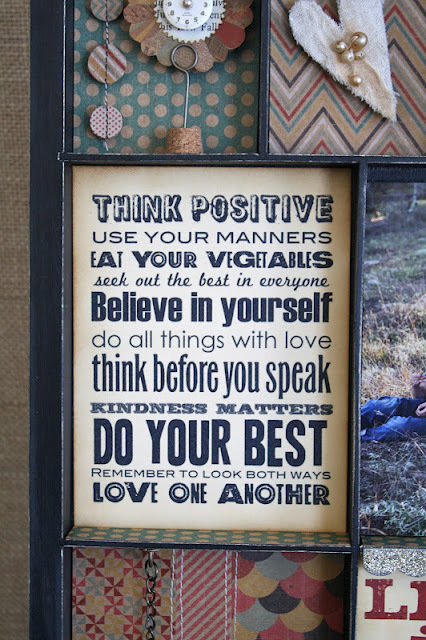 Your wonderful project is going to be a huge success at the auction. Big hug for being such a nice and generous lady. Paula, Paula, Paula, Paula, Paula...as always, you take my breath away. I decided to do a little crafty jaunting around the internet when I should be working (shhh...!) and I came upon your post. I can't thank you enough for yet another mindblowingly creative, beautiful donation to our event. An I hadn't even sent you my personal email plea yet. Wow, you are the best. I love you, dear friend. Thank you so much for the support. Seriously, I'm in tears. Oh my! I was in pismo beach area just in Dec 2011 and had no idea there were scrapbook stores around! Fortunately, I do have enough craft stores and scrapbook stores quite close to where I live.